So you have to make a speech? And the thought terrifies you? Well, you’re certainly not alone. Survey after survey has indicated that fear of public speaking is one of the very most common fears. Even many top professional speakers experience some little bit of “stage fright” when they speak. It is normal and natural. The key is to control this nervousness and use it as form of adrenaline instead of anxiety. Public speaking doesn’t have to be something to be feared, with the right mind set and training you can approach your speech with confidence. Very few people have genuine biological “communication anxiety” (the fear of communicating). What most people have is “evaluation anxiety” based on the irrational thought that they will be harshly evaluated by their audience. This could not be further from the truth. The truth is the audience wants you to succeed. Recall, for a minute, the worst speaker you’ve ever seen in person. How did seeing that speaker struggle make you feel as audience member? Probably uncomfortable. You probably wished that the speaker would pull themselves together and finish the speech strongly. As a speaker, you also have something that the audience wants. They are present to hear from you. You will provide them with some entertainment or information that they would otherwise be without. They have an interest in seeing you succeed. And, since they have not chosen to speak themselves, they may very well admire you for your courage. Your fears may also be compounded by the fact that you believe that the audience will perceive your nervousness, but this is not nearly the problem that you may think. Most physical manifestations of speech anxiety feel significant to the speaker, but are really only very slight and subtle. For example: If your hand is shaking a bit, it feels like big deal to you. However, even audience members in the front row are unlikely to pick up on it. And finally, remember that you are your own worst critic. Your audience members have lives of their own. Any minor flaws in your speech will likely go unnoticed by members of the audience. Any major flaws will likely soon be forgotten by members of the audience. No one is evaluating you as harshly as you are evaluating yourself. Practice, practice, practice – The more prepared you are, the more confident you will feel. Use visualization- Imagine yourself giving a successful speech. Think about your past speaking successes. Prepare yourself mentally to succeed. Or, imagine how happy you will be when your speech is over. Whatever puts you in a positive frame of mind. Reframe the speech- Think about the speech as a simple conversation. Think of your audience as friends. You wouldn’t be frightened to converse with your friends. A speech is fundamentally the same thing, except that you may not have yet met your “friends” and they are unlikely to interrupt you. Exercise- OK, so it may not be practical to sprint from your car to the podium on speech day, but exercising a couple hours before your speech can have a great effect. Exercising releases stress and tension, two feelings synonymous with speech day. Develop your skills- The more you understand the speech-making process, the better equipped you will be to succeed. Use this site as a starting point, but also consult other public speaking-related books and DVD’s for more insights. Use a checklist- Don’t let yourself worry about skipping a step or leaving out some important element of your speech. Use a checklist to ensure that you’ve covered all the bases. Fear of Public Speaking Phobia – Test Yourself. Answer questions below using a five-point scale (strongly agree = 5 points, agree = 4 points, undecided or neutral = 3 points, disagree = 2 points, strongly disagree = 1 points). 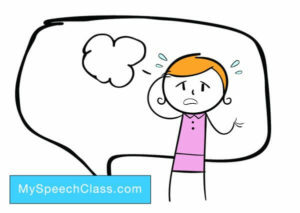 Your speech anxiety is Low if your score is up to 15 points. You actually have no big problem. No need for a self help training program, only for improving your oral skills perhaps. Your feelings and motions in front of an audience are normal tensions every public speaker has in the beginning. They can be overcome with a good night rest and breathing exercises. Nothing to worry about you are not feeling uncomfortable at all. If your score is up to 45 points. Welcome to the club! Like the majority you are feeling very uncomfortable. Nerves and tensions influence your behavior seriously. But there is a way out. Think about some form of social phobia treatment program. No worries. If your score is more than 45 points. You suffer from the fear of public speaking phobia effects. It is extremely difficult for you to speak in front of a group. But, you are aware of the necessity and the possibilities to cure your persistent aversion. Cite this article as: Jim Peterson, "Speech Anxiety," in My Speech Class, May 11, 2009, http://www.myspeechclass.com/anxiety.html.